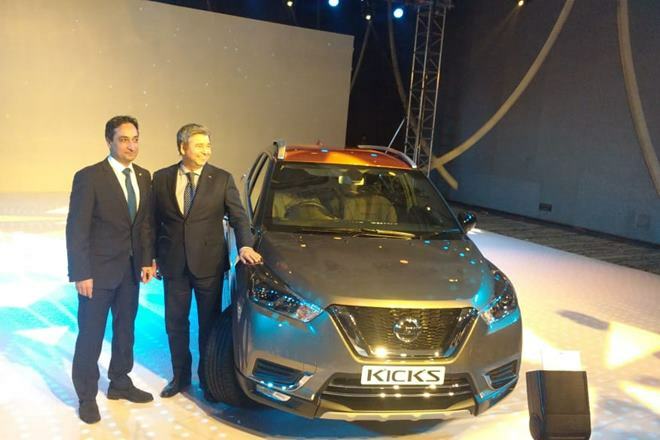 Nissan India has finally launched its New SUV Nissan Kicks in India. After so many advertisements and media reviews Nissan has launched this new SUV in Indian Market. After the 2013 launch of T The Kicks will compete with Hyundai Creta , Jeep Compass and Upcoming Tata Harrier in India. This all new car from nissan is offered in both petrol and deisel fuel options. The kicks is launched in four variants XL (Base ), XV, XV Pre and the top of the line XV Pre (O).The petrol option is only available in XV and XL Variant. The Nissan kicks price starts from Rs. 9.55 lakhs (Ex-Showroom) in India. And price for the top of the line variant XV PRE (O) is Rs 14.65 lakhs (Ex-showroom). People are expecting lot from this car as Kicks is the only car from Nissan which is launched by the company after 2013 Terrano launch. Buyers can book the car from today at the token amount of Rs.25,000. One of the main highlight of Nissan Kicks is 360 degree camera , which is also first in this segment. The Kicks is made on the V platform , it is the same platform on which Nissan Micra has also made. The design of the car matches the similar design language as other Nissan cars like New Micra. The Nissan kicks launched with two engine options 1.5-litre petrol and 1.5-litre diesel engine. The petrol engine produces power of 105bhp/142Nm . And comes with a 5 Speed Manual Transmission. On the other hand diesel engine produces 108bhp/240Nm with a six-speed manual transmission. The petrol variant has a ARAI certified efficiency of 14.23kmpl whereas the diesel one has ARAI-certified efficiency of 20.4kmpl. As far as safety is concerned , Nissan kicks is equipped with 4 Airbags , ABS with EBD, Brake Assist and Hill hold control. All variants of the Nissan Kicks comes with climate control with rear AC vents ,LED DRLs, Indicators on side mirror, Driver seat height Adjustment and LED DRL’s. Talking about infotainmnet system, Kicks gets 8.0 inches of touch screen infotainment system from XV variant. And top of the line variants gets 360camera with surround sound support.